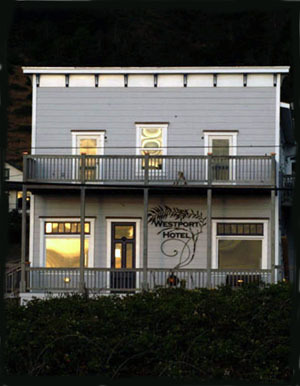 The Westport Hotel is a historic Victorian Bed & Breakfast (circa 1890) located on Highway 1 at Westport. Long time Westport residents Dorine Real and Lee Tepper lovingly rennovated the historic hotel, honoring its past, yet bringing it into present time for coast travelers to enjoy. Guests can bask in rooms with fabulous 2nd floor and patio views of the rugged coastline in remote Westport, making the Westport Hotel a must see on your list of adventures for the Mendocino Coast. In the newly remodeled hotel guests can enjoy the olde fashioned dining room with a hot breakfast dish accompanied by scone and fresh fruit. Delicious organic mochas or lattes can be prepared in the bar where a variety of micro-brewed beers and California wines are also served. The gorgeous bar top is a solid piece of rare redwood knotty burl that glows in the setting sun. Indeed dining here is a bit of a mystical experience with a solar powered crystal spinning out rainbow comets across the deep hew of the natural wood walls of the Old Abalone Bar. A star studded tapestry of Comet Kahotech hangs on the west wall and on weekends a key boardist or guitarist plays live dinner music. Dorine and Lee even remember a night when the Aurora Borealis glowed and danced above the remote ridgelines of the Lost Coast just to the north. Todays guests can anxiously await a rare glimpse of the "Green Flash" as the setting sun slowly sinks beneath the Pacific horizon. Upstairs are six comfortable rooms with private baths and ocean views. The inn can accommodate couples or groups of up to 12 people with rates for 2 from $150 - $225. With ocean access is right across the street. A platform to gather can be used to set up a telescope for whale and bird watching by day and stars and constellations by night. Indeed, the bride, groom and wedding party can have the most inspirational weddings and receptions here at the Westport Hotel. Special arrangements can be made for your passages and celebrations during your life. The food is absolutely delicious. Dorine and staff have a wonderful instinct for consciously combining ingredients that are unusual, yet still have a sense of comfort food. Classic pub food and intriguing special dishes are served on weekends and to the Westport Hotel guests mid-week. Of special note are Dorine's afternoon teas served at 3pm - 5pm Saturdays or on special occassions by arrangement. The atmosphere is relaxed, cozy, and a little bit elegant. Join a sophisticated crowd of explorers who show up to celebrate in the dining room and Old Abalone Pub on weekends. During the week the Westport Hotel is a perfect place to pick up a mocha or espresso for your trek north to the Lost Coast.